Kiev, Maydan Nezalezhnosti, November 2016. Photo courtesy of the author. All rights reserved.Almost a third of a century has passed since the collapse of the USSR, and like never before, the symbolic legacy of the 1917 October revolution is at the centre of Ukraine’s political discourse. The protests on Kyiv’s Maidan and ensuing conflict with Russia have reawakened, to use the eminent theorist of nationalism Ernest Gellner’s metaphor, the Sleeping Beauty – the Ukrainian nation – from the “mystic sleep” she seemed to have fallen into after the 2005 Orange Revolution. New, ambitious projects await – among themffecting a final break with the Soviet past. Why, after all this time, is the Soviet legacy in Ukraine still just about “Public Enemy No 1”? And why does dealing with it require a strategy of revolutionary propaganda on a truly Leninist scale? In fact, perhaps it’s precisely the practices of decommunisation which best reflect the social and political climate in post-Maidan Ukraine – and not least, the country’s complex relations with its neighbours. Many Ukrainian politicians and public intellectuals believe that the crucible of a continuing bloody conflict in the country’s east has led to the Ukrainian nation making an irreversible,conscious choice in favour of democracy and Europe. On 1 September, president Petro Poroshenko promised the students of a secondary school in the Kharkiv Province that the children taking their first steps at primary school that day would see Ukraine become a fully-fledged member of the EU. A week later, in a speech to the Ukrainian parliament, he was equally optimistic in stating that his government was ready to bring Ukraine closer to not only the EU – but NATO as well. Many of his country’s citizens have, however, little first-hand experience of European democracy and bureaucracy. For most Ukrainians, living in the traditional “Soviet” (or already post-Soviet?) manner, i.e. from month to month, that ideal Europe plays a similar role as nostalgia for the Soviet years – reflecting a far-off dream of financial stability and decent social welfare. In the same speech to parliament, Poroshenko said “Ukrainians should feel the presence of Europe, even if they never leave their own country” and stressed that he was also referring to his citizens’ “level of material well-being”. Three post-Maidan years have, however, shown that carrying out economic and social reform, reconstructing the education system and fighting corruption and poverty – in other words, making Ukraine “truly European” – is a lot harder than challenging attitudes toward Lenin and his associates – many of whom live on in bronze and stone to this day. In his speech to Kharkiv school students, Poroshenko also stated that “cutting edge technologies would allow us [politicians and teachers?] to create new Ukrainians”. It was evidently thanks to these new technologies that the Ukrainian elite, buoyed by yet another change of government, announced its determination to once more overcome its Soviet past as a means of drawing closer to an imagined Europe. A package of four “decommunising” laws, one of which outlawed all Soviet symbols as totalitarian, had already been passed with unbelievable speed in May 2015. In other words, the political elite decided that Ukrainians had to be done with anything connected with their Soviet and/or peasant past. 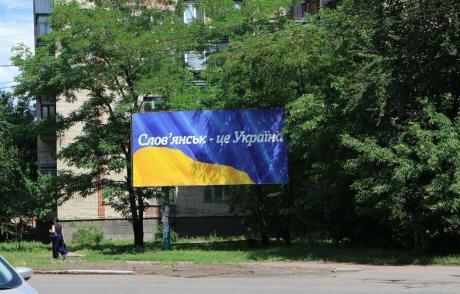 "Slavyansk is Ukraine", July 2017. Photo courtese of the author. All rights reserved.Any casual observer who lived through the process of rejection of Soviet symbolism in any ex-Soviet republic in the 1990s must be now experiencing déjà vu. There’s nothing much new to be found in reconstructions of the memorial landscape and destruction of sites associated with the Soviet regime. In Ukraine, like everywhere else, the most famous monuments were demolished immediately after the USSR’s collapse, with more enthusiasm in the west of the country than in the central and south-eastern provinces. And like everywhere else, there were just too many “Bolshevik” monuments, not to mention squares and streets to destroy them all. Even in western Ukraine, and even in the course of several waves of emotion, one of which was the penultimate Ukrainian revolution of 2004. The mass “Leninopad” in the winter of 2013-4, when statues of Lenin were destroyed wholesale, didn’t help either. This law package followed a certain decline in destructive enthusiasm, and enabled the process of decommunisation to proceed in a more routine fashion. According to sculptor Yuri Merkurov, creator of a granite statue of Lenin that stood on Bessarabskaya Square in the centre of Kyiv (which only actually became famous after it was demolished in December 2013), “the country demanded” the creation of an enormous number of new monuments. Now the country, or at least those of its citizens who are most in the public eye, have demanded that its politicians demolish them. More than 50,000 streets in the country’s towns and villages have also been renamed because of some connection or another with the Soviet past. Considering the untiring efforts of Merkurov and his sculptor colleagues, not to mention the generosity of the Soviet regime in its patronage of the arts, the Ukrainian government can continue to exploit its populist image as an uncompromising enemy of the Soviet past for some time to come. Especially since decommunisation seems, at first glance, to be one of the few areas where it can’t be too hard to achieve at least statistical success. In the same speech in parliament on 7 September, Poroshenko reported his success in destroying more than 1,300 statues of Lenin and renaming nearly a thousand towns. And these are by no means the only achievements of Ukrainian decommunisation. More than 50,000 streets in the country’s towns and villages have also been renamed because of some connection or another with the Soviet past. The post-Maidan government is inclined to push its own image as the only true enemy of the legacy of Soviet totalitarianism. But the question arises: will itsapproach to decommunisation actually promote greater solidarity among Ukrainians themselves? The emotions around “Leninopad” (of which Merkurov’s statue became a symbol) quickly dissipated after the winter of 2013-4. But if the demolition of yet more monuments to leaders of the international proletariat has lost any interest it had among ordinary Ukrainians, a key memorial site from the Soviet years has retained its relevance for many of them. Historian Aleksey Miller believes that you can’t exclude communism from Russia’s national history because “the Victory over Hitler’s forces in 1945 occupies a central place in our national mythology, which amongst our neighbours, only Belarus and south-east Ukraine share”. But the Second World War holds an important memory for western Ukraine as well – except that it’s not a story of Victory, but of occupation. 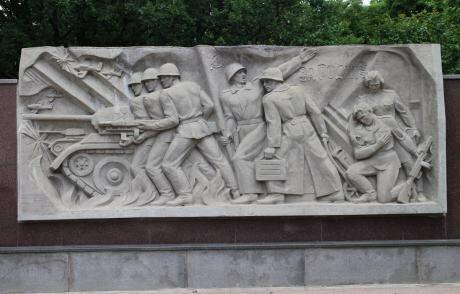 So do we have to see the Soviet military-monumental tradition, the mythology of victory and surrounding rituals , as part of the totalitarian legacy that we need to reject? Decommunisation laws (including the law on the Commemoration of the Victory over Nazism) seem to suggest that we do. The Great Patriotic War, as we called it, has now become the Second World War. In this narrative, the Soviet Union must share the blame for the outbreak of war, and both the totalitarian regimes of the 1930s, the Nazi and the Communist, are guilty of war crimes and genocide against the Ukrainian people. But having taken a number of decisive steps towards the decommunisation of the ictory of 1945, the government evidently baulked at a complete devaluation of this memory.Instead, it came up with something of an oxymoron: there will now be a public holiday on 8 May - VE (Victory in Europe) Day for Europeans and Americans, to be known as Remembrance and Reconciliation Day – and a second one on 9 May, to be called, as in Soviet times, Victory Day. Does that mean one celebration for western Ukraine, and another for the pro-Russian south east of the country? The bigger question, however, is whether this attempt to decommunise 9 May is an impossible task. Even the Soviet propaganda machine failed to inculcate the mythology of cictory in western Ukraine and suppress the memory of local heroes. Could retaining Victory Day’s status as a public holiday help today’s national propaganda efforts win the support of the south east? Fragment of the WWII memorial in Svytatohorsk, July 2017. Photo courtesy of the author. All rights reserved.Every Ukrainian nationalist will find something Soviet and Putinist in commemorations of Victory Day. The aesthetic of military monuments and rituals; the veterans with their uniforms and medals – and a lot more – inevitably raises the spectre of Soviet mythology. Perhaps it would be possible to construct a commemoration that could involve the whole of Ukraine as part of the western European 8 May celebrations. But given the country’s present conflict with Russia, the Ukrainian government and its key ideological agency, the Institute of National Remembrance, have instead made yet another attempt to nationalise the myth by flooding the public space with counter-symbols and counter-discourses. It’s a question of Ukraine’s new red poppy against Russia’s orange and black St George Ribbon. Perhaps the Soviet crest on the shield of Kyiv’s Motherland Monument will soon be replaced by the Ukrainian trident. What is more important is that the main strand of this nationalisation of the myth is a resurrection of “our heroes”. Poroshenko has gone further than Viktor Yushchenko, president in 2005-2010, in passing a law “On the Legal Status and Remembrance of Fighters for Ukrainian Independence in the 20th Century”. These include the Organisation of Ukrainian Nationalists (OUN) and the Ukrainian Insurgent Army (UPA), who were infamous for their involvement in the Holocaust and the Volyn Massacre. Now, any denial of the legitimacy of their fight for independence has been made illegal; an insult to the memory of the fighters and dignity of the Ukrainian people. If the law is transgressed (though who will decide where this dignity begins and ends? ), even foreigners doubting the warriors’ feats will be liable for the consequences. Even the famous campaign by Putin’s ideologists against the “falsification of history”, which reached its peak in 2009-2012, will be nothing in comparison. By accentuating the differences in regional commemorative traditions, the conflict with Russia has only intensified this rivalry between the Second World War and the Great Patriotic War. Meanwhile, the mobilisation discourse that has predominated since 2014 forbids any mention by politicians of a regional divide. We have instead a dubious ironic hyperbole, where we thank Putin for the actions (the annexation of Crimea, invasion of eastern Ukraine and so on), that have finally turned Ukrainians into a coherent national community. But can just a common hatred of Russia really unite them, and if so, for how long? The government’s “revolutionary decree” demonstrates its determination to affirm the unity of all Ukrainians, be they western or south-eastern. In doing so, it’s given preference to the myths around the OUN and UPA, united only in their hatred of the Muscovites. The tensions between the pro-European west of Ukraine (only annexed by the USSR in 1945) and the pro-Russian south east are undoubtedly often simplified. Regional borders are not always obvious. The active and mobile element of the post-Soviet generation crosses them more easily than the middle-aged. The Ukrainian government’s concerns are also understandable: there is a lot of truth in the idea that the politicisation of regional differences has become a major obstacle to stability. But will denial, silence or the ultimate demand that Ukrainians whose fathers and grandfathers fought in different trenches respect and venerate the “Banderists”, or followers of Stepan Bandera, help bring the two sides together? Regional differences, reflecting a rich and diverse culture, are normal for any large country. The problem isn’t in the differences themselves, but in how they are perceived. After the collapse of the USSR in 1991, and then in 2005 and 2014, the government could have tried initiating a broad and open dialogue aimed at depoliticising regionalism and turning what was seen as a weakness into a strength. But either the sin of silence turned out even stronger, or the government lacked legitimacy, or the politicians had their own ideas about how to use regionalism. 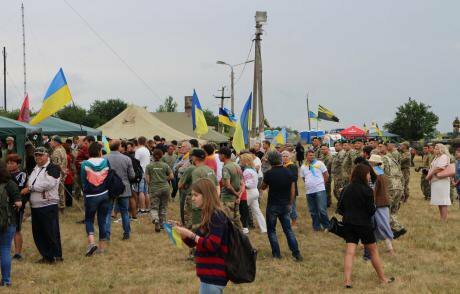 Celebration of the third anniversary of liberation on Karachun hill, Slavyansk, July 2017. Photo courtesy of the author. All rights reserved.The years of Viktor Yanukovich’s rule and Russia’s destabilisation of Ukraine did a lot to derail, and even marginalise, the position of the south-east and the mythology of the “Great Victory”. In this conflict situation, many intellectuals have either drifted to the right, or just don’t want to risk making unpopular critical statements. So while during the Soviet years the mythology of the Great Victory was forced on the whole of Ukraine, now it’s the turn of the OUN/UPA to be lionised. Today’s dominant national myth (the “Banderist” version) is still of little use in bringing about Ukrainian political and cultural integration. That said, it fits well into the wider narrative of contemporary nationalism, founded as it is on a total suppression of the fact that Ukrainians were complicit in the creation of both the Russian Empire and the USSR. Many members of the post-Soviet generation believe that their country was a Russian colony and that the Bolsheviks, a completely alien force, occupied a Ukraine that had already gained its independence. This version of history also has a western Ukrainian slant, given that this region, like the Baltic States, only became part of the USSR after the Second World War. However, the territory of today’s Ukraine was determined first by Imperial, and later by Soviet expansionist politics. Ethnic Ukrainians also made an enormous contribution and were rewarded with a share of the “cake” when the Soviet Union was divided up after its collapse. It has not been an easy task to unite the country’s population within the context of modern Ukrainian nationalism, while denying the involvement of the Russian Empire and its successor, the Soviet Union in that nation’s formation. So far, it seems to me that Ukrainian government has been unable to pull that act of unison off. Which is not surprising: there is simply no way of assimilating the country’s contradictory imperial legacy and integrating its citizens within a context of post-Soviet Ukrainian nationalism. What is striking, however, is less the contradictions of “decommunisation” itself than the emotional uplift which has resurfaced during its implementation. Witnessing the passion of its torchbearers and supporters, you feel you’re back in 1990-91. According to the historian of public monumental art Sergiusz Michalski, photo-reportages of the destruction of monuments back in the day are a “major visual symbol” of the fall of Soviet regimes. In other words, the monuments have played a much larger historical role after being demolished than they ever did while fulfilling their original commemorative function. 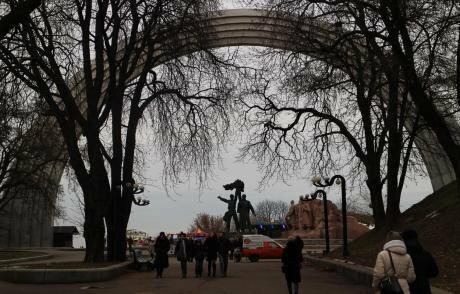 Friendship of Nations Arch, created in honor of the 60th Anniversary of the USSR, Kyiv, November 2016. Photo courtesy of the author. All rights reserved.Why are feelings running so high now, almost 30 years after the collapse of the USSR? Perhaps because in the former outposts of the Empire, Russia was always identified with the USSR. Given the Putin regime’s determination to monopolise the rights to the obviously “embellished” legacy of the Soviet Union, de-Sovietisation/decommunisation is becoming an obligatory symbolic practice designed to counter enemies without and within. This is particularly salient in areas which have seen armed conflict such as Georgia, where a “Freedom Charter” was introduced after the 2008 war with Russia. In Ukraine, decommunisation is accompanied by a mass renaming of itowns and villages, streets and squares. Yet its inconsistency is a constant reminder of the Ukrainian government’s inability to implement its own directives and laws in a timely and systematic fashion. In the centre of Slavyansk you can still walk along Communard Street, and in the centre of Kyiv you can cross Red Army Street. Both streets were officially decommunised years ago. Dnipro, Ukraine’s fourth largest city, is still Dnipropetrovsk on most road signs. If you were to list all these unchanged names, the list would be as long as one of the tens of thousands of officially decommunised streets and squares. Most ordinary Ukrainians, however still use the old names.Three years after the events on Maidan, they’re more concerned with their own social problems than the toppling of yet another Lenin. The conflict that broke out with Russia in 2014 decisively confirmed the “negative” Imperial legacy narrative. Official Ukrainian nationalism is adopting ever more militaristic and vengeful traits. The concept of an enemy (within and without) is needed more than ever before, to establish the necessity for complete solidarity among Ukrainians. The government and the Institute of National Remembrance are busy trying to boost Ukrainians’ national pride with the help of militaristic arguments and narratives. A visual display concentrating on 24 warriors, curated by the Institute’s director Volodymyr Viatrovych as part of its “Warriors. The History of Ukraine’s Army” public project is designed to show today’s Ukrainians the timeless story of their people’s military prowess. There doesn’t however, seem to have been room for Imperial and Soviet-era Ukrainian warriors in the display. Despite the fact that the armed conflict in eastern Ukraine goes through “hot” and “cold(er)” phases (there was the usual escalation of fighting along the contact line this summer), its heroic commemoration has never let up. In Kyiv you can bow before the monument to what is officially known as the anti-terrorist operation (ATO). The second and third anniversaries of the “liberation of Slavyansk” have been marked both in the Donbas city itself and on the nearby Karachun Hill, where the main Ukrainian army forces were deployed. And although national trauma is always a popular topic, the commemoration has a certain note of triumph in it, a celebration of a victory over the “Russian occupiers” and their “terrorist” associates. 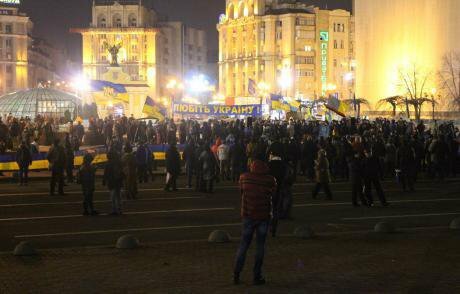 It must be said that ordinary Ukrainians are often unaware of, or perhaps indifferent to, such liberation celebrations. Celebration of the third anniversary of liberation on Karachun hill, Slavyansk, July 2017. Photo courtesy of the author. All rights reserved.The Soviet commemorative legacy, with its practices and terminology officially dead and buried, even pervades the populist pronouncements of not only president Poroshenko but the ultra-right patriots who gathered on Karachun Hill in July 2017. ATO veterans, as well as their predecessors from the Soviet years and even the Second World War, were thanked for their efforts to keep “a peaceful sky above our heads”. And Bandera’s imposing monument in L’viv – just like Lenin – is “so young”. The official national discourse tells us that we need to fight for your country, your land, your nation, and your people. Just as in Soviet times, ordinary people’s pain pales before these higher goals, and there is no such thing a war without casualties (including peaceful civilians). Given the strength of current Russian and Ukrainian nationalisms and the militaristic and revenge-seeking rhetoric popular in both countries, a peaceful transformation of the situation is highly unlikely. In fact, if these tendencies persist for the next 20-30 years (which may well be the case) the conflict is likely to intensify. Maybe an antidote can be found in the everyday resistance of the man or woman in the street. Many Ukrainians and Russians are unprepared for war and more concerned about social problems. Economic and even cultural ties between Russia and Ukraine are still intense and many intellectuals are ready to strive for a peaceful transformation of the conflict. Until Ukraine, which, like Russia, is a successor to the Russian and Soviet Empires, comes to terms with its past, the outlook seems dim. The new laws, Poroshenko’s falling to his knees in front of the memorial to the victims of the Volyn Massacre, the new national narratives – all these either have a purely superficial effect or merely offer to replace one dubious myth with another. This approach does little to help people recognise the depth of their responsibility to history and reconciliation with their own past. Kyiv’s famous Maidan Nezalezhnosti, a space filled with memories of the collapse of the USSR and two post-Soviet “revolutions”, is the best place to take in the spirit of this contradictory situation. The architectural design and aesthetic of what has become the symbolic epicentre of anti-Imperial and anti-Soviet activity is actually one of the most impressive examples of Ukraine’s totalitarian heritage. A constructive relationship with the past can produce change in the future – alternatively, we can just retouch yet another heroic myth. The choice is ours. The author thanks the German Ministry of Foreign Affairs for its support for the projects carried out by Berlin’s Centre for Independent Social Research (CISR), designed to contribute to the peaceful transformation of conflicts in the post-Soviet space.